Beetroot is a commonly used vegetable in East European cuisine and can be found in many traditional foods. Everyone knows borsch, the most famous Russian and Ukrainian dish, but very few know that there is a cold version of a famous beetroot soup as well. It is a wonderful summer treat, when young beetroots are in season, and can be mixed with any garden herbs of your choice. Of course, as all our recipes – it is very easy to make! Step 1. Boil beetroot until soft, peel it and cool it down. Step 2. 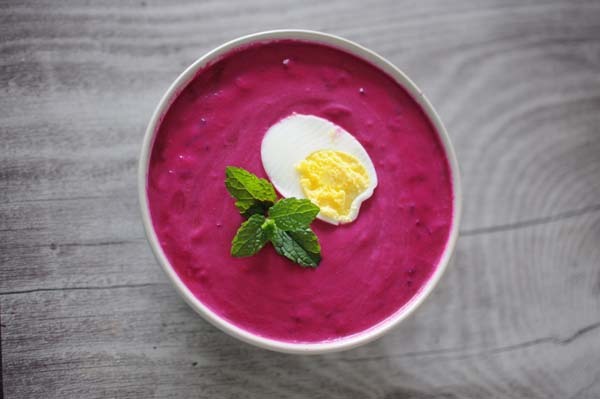 Cut beetroot in smaller chunks and process in a blender together with yoghurt, until smooth. If you want it more watery, you can add more yoghurt/kefir,a bit of water or even freshly squeezed lemon juice, until it reaches the desired consistency. Step 3. Transfer the mixture into the larger pot, add spring onions, dill, cut cucumber and mix your soup thoroughly. Step 4. The soup is ready to serve! Optionally, you can add a hard-boiled egg on top and any herbs of your choice for decoration. This cold beetroot soup (which is also called Chlodnik in Polish cuisine) is a seasonal dish, which is best enjoyed when young and tender beetroots are available.